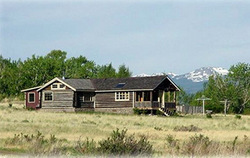 The Absaroka Cabins have been moved to the site and extensively renovated. The main cabin is log and has two bedrooms, one bath, a hide-a-bed in the living room, full kitchen, laundry and can be rented separately. The back cabin is stucco with two bedrooms, two baths and may be rented with the main cabin (this cabin does not have a kitchen). The property is very private with stunning views and plentiful wildlife. Hiking and horse access to BLM and Forest Service lands on Emigrant Peak is provided through a gate on the east property boundary. It is several miles to Chico Hot Springs, Dailey Lake and the Yellowstone River. Contact us at 406-222-6519 for rates and additional information. Directions: The Absaroka Cabins are located at the end of a private road at the base of Emigrant Peak, off East River Road, halfway between Livingston and Gardiner on the east side of Paradise Valley.